Which season finale qualifying method was better? At the African Badminton Cup of Nations on Tuesday, the home team in Mauritius medalled in all but one event but couldn’t prevent the titles from leaving the island nation. Local hopes were especially high in the two women’s events, where Mauritian players had reached the final. Kate Foo Kune (pictured) had made it to the women’s singles final with a first-ever win over Hadia Hosny of Egypt in the semi-finals. However, after pushing Nigeria’s Grace Gabriel to extra points in the first game of their final, Foo Kune was unable to come up with a formula to get back in the match in the second game and had to settle for silver. Not all the titles left for the mainland, however, as it was Juliette Ah-Wan / Allisen Camille of the Seychelles who beat out the other finalists playing at home, Shama Aboobakar and Yeldie Louison, for the women’s doubles crown. The mixed doubles and both men’s events went to South Africa, to add the the mixed team gold they won on Saturday. Two of these came in all-South African finals. The third, men’s doubles saw Enejoh Abah / Victor Makanju of Nigeria unable to avenge their team’s defeat from the mixed team final. 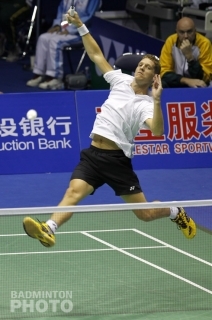 On Saturday, it had been South Africa’s Andries Malan and eventual triple-gold winner Willem Viljoen (pictured) sealing the 3-0 win by taking the men’s doubles point against the other Nigerian pair of Ola Fagbemi / Jinkan Ifraimu Bulus. Fagbemi and Bulus did slightly better against the South Africans in the individual quarter-final but still fell in three games. Apart from Ah-Wan and Camille, who had the shortest trip home, all of the finalists stayed on the island for the Mauritius International Future Series event. Copyright Badzine.net. All Rights Reserved.